A Liberal dose of MASALA. S made these amazing Nankhatai for Christmas. As kids, we got to eat them a couple of times in a year, when my grandfather sent them by parcel all the way from Mangalore. We knew them then as Narayan Katar, don't ask me why they were called that! The transportation by lorry took a long, long time, but well worth the wait. 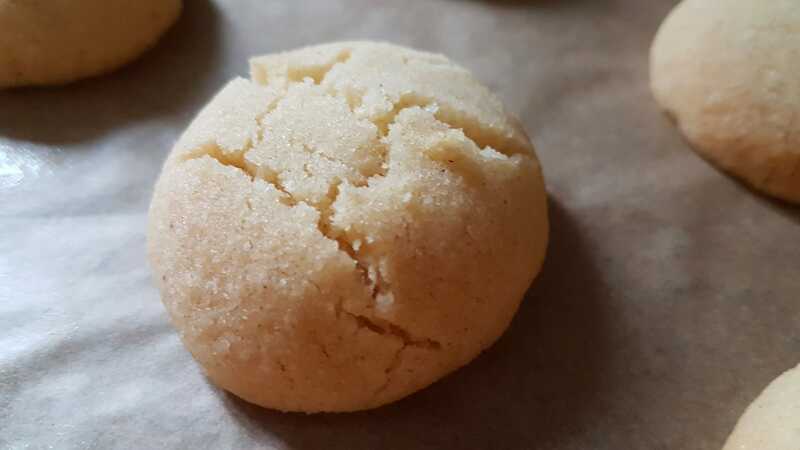 The recipe link is from Ruchik Randap, and S made only slight modifications. Take the melted ghee (ensure that it is not too hot) in a bowl and add powdered sugar gradually, little at a time, till well mixed. Sift the flour, baking soda and salt. Add to the ghee and sugar mixture. If the mixture is paste like add a bit of flour. It should be kneading consistency. 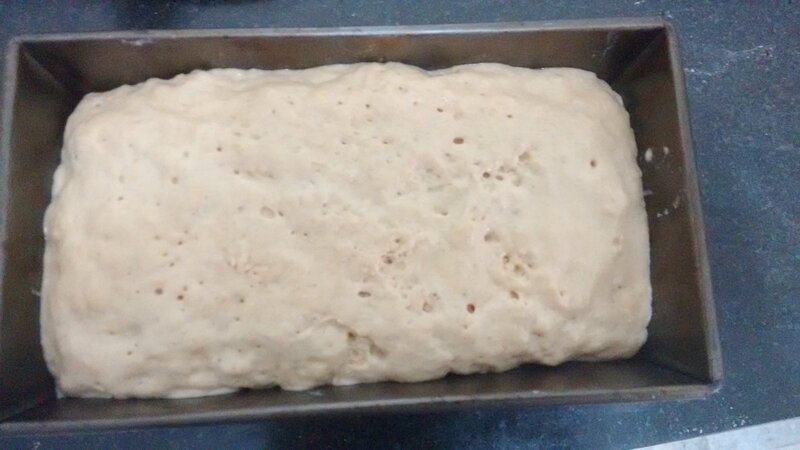 Lightly knead the dough till smooth. Place in bowl, cover with clingfilm and keep aside 4 hours. The dough might become firmer now. If so, gently knead and make it soft and pliable. Divide dough into equal sized portions. 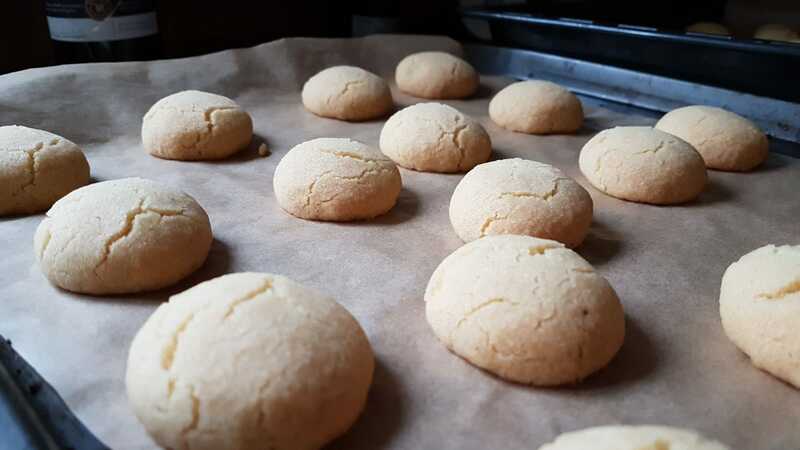 Roll each portion to a ball and gently flatten the sides (only). The centre should be like a raised dome. This will enable the cracks to form on surface. Bake for about 10-12 minutes. Keep checking. Do not over bake or brown . Remove from oven and let them cool on tray for another 15 minutes, after which they can be gently transferred to a wire rack till cool. 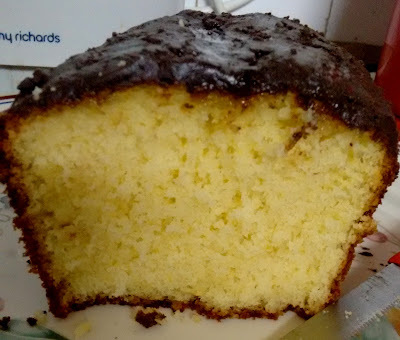 This is a easy cake recipe from the BBC Good Food. It had good reviews and I made a few changes more because I ran short of a few ingredients. The family loved it. Do try it ! The original recipe is here. The changes I made are in italics at the end of the recipe. Place ingredients for the cake in a bowl - butter, self raising flour, baking powder, caster sugar, eggs, milk and zest. Beat with hand whisk or a wooden spoon for 3-5 mins till light and fluffy. Place in oven 40-50 mins till golden brown and done. As the cake is baking heat the orange juice and sugar gently, till the sugar is dissolved. Once the cake is done, remove from oven and spoon the orange mixture on it. Leave it in the tin till it cools. Then remove and keep on wire rack. Prepare the chocolate. Place in bowl and melt over simmering water or in a microwave as per instructions on the pack. Drizzle over cake and leave to set. Instead of orange juice, I used orange marmalade for the additional peel that it contained to which a little water was added and gently heated till it dissolved. Poked a few holes in the cake and allowed it to seep inside and also coated the surface. Plain chocolate was used instead of dark chocolate and I did not drizzle it but applied it to coat the top. I had this at a restaurant well known for the Sindhi cuisine. For me, kadhi has always been a yoghurt based gravy and this one had none. It was tangy and tasty. A search online led me to Sindhi Rasoi and the chickpea flour based gravy with a whole lot of vegetables turned out delicious. Just what you should have with a bowl of rice. And surprisingly while it may not be the traditional accompaniment, it was good with roti too. 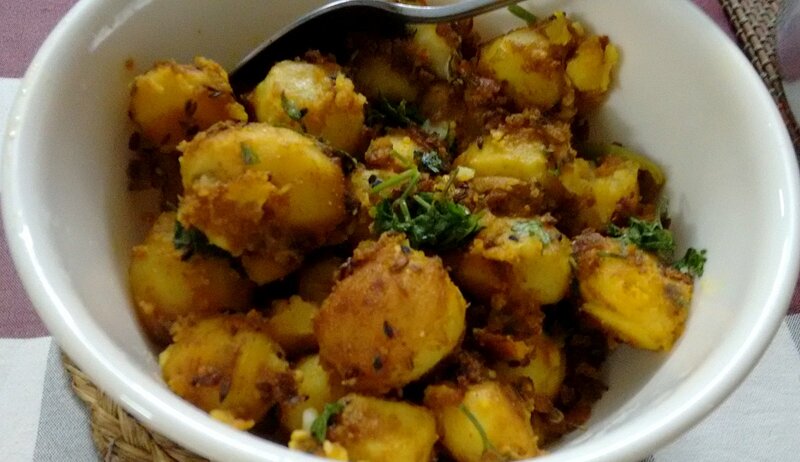 Also, as Alka states, this is a dish that can be made in large quantities, ideal when you have guests. Add gram flour and cook on low flame with constant stirring, as the flour turns brown, do not burn, add chili powder, grated tomatoes, keep mixing. Add water if required at this stage. Add turmeric powder, ginger, green chilies and salt. Close the cooker . Let it come to full pressure and then simmer for ten minutes under pressure. Allow to cool. Open the cooker. Add all vegetables except the okra and once again bring to full pressure and take off heat. Now add the fried okra and tamarind paste. Simmer for a few minutes till raw taste is gone. This is a useful recipe. Requires no fermentation. And instant. 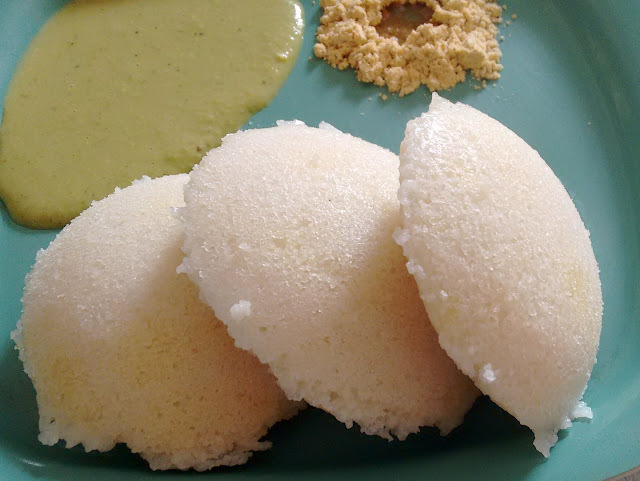 The idlis are soft and fluffy and remain so even when cold. 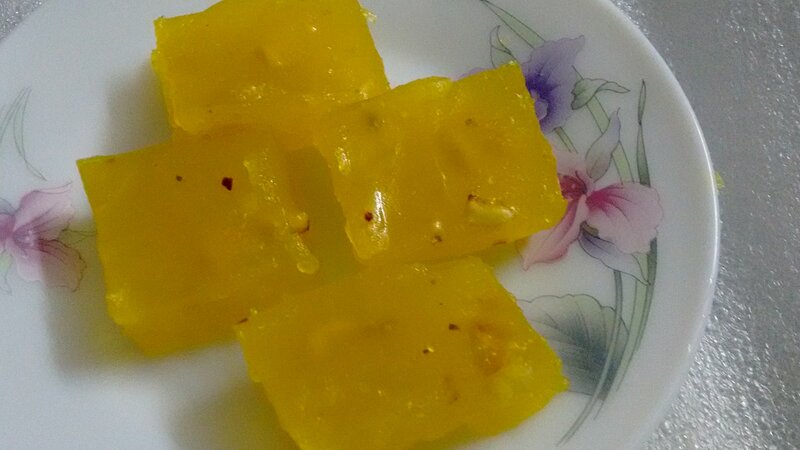 This is a recipe that was posted by Roopa Bhandari. It will become soft. Mash to a smooth paste. Steam for about 7-10 minutes in steamer or a cooker without the weight. Remove the mould from steamer. Cool a bit and spoon out the steamed idlis. * You can use the thick variety of poha, but you may then need to grind it to a paste. At this stage, take the corn flour mixture, mix again and add to the sugar solution that is still on the heat. Keep stirring continuously as you add. It will form some glossy parts scattered in the mixture as you keep mixing. Continue till it gets thick. The colour will change and turn glossy. At this stage add the ghee and keep stirring. The mixture will boil up and also come together. Getting more glossy. Add the cardamom powder, cashew bits. Stir in. Turn off the heat. Pour into the greased plate. Allow to cool for about 1-2 hours. Cut into pieces. I quite like the kneading process in bread making. 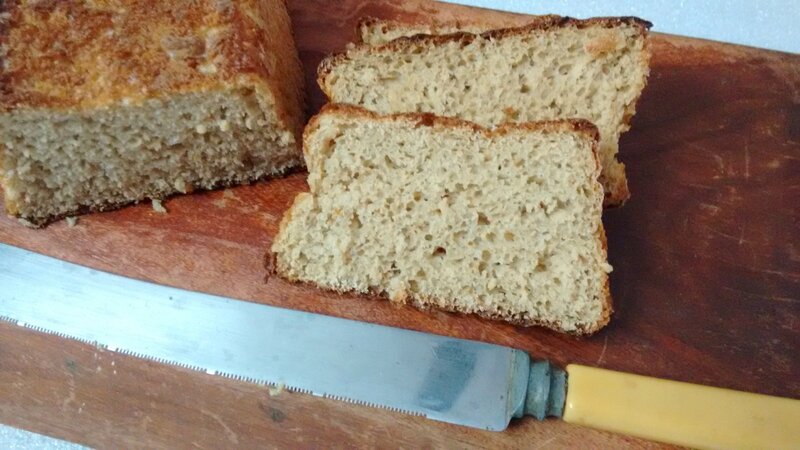 All that pull, stretch action is quite therapeutic and besides that sense of achievement when you knock the loaf out of a tin and slice to find it as good if not better than the store bought ones. I however loved the look of the Ballymaloe bread. I wish I could use the whole wheat flour that we would get from the mill but settled for the packaged whole wheat flour that we use for rotis. The bread , the recipe is from David Lebovitz, was invented to simplify the process of bread making . This is indeed a simple, easy recipe for anyone to gain confidence in baking breads and using yeast. 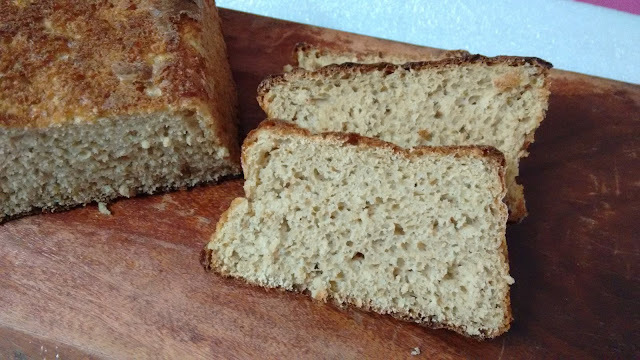 By using the packaged wheat flour, the texture Lebovitz explains can change. The dough as he said was not coarse, but a little sticky. And I did have a problem in getting the baking parchment off the baked bread as we remove it from the tin half way through the baking process. 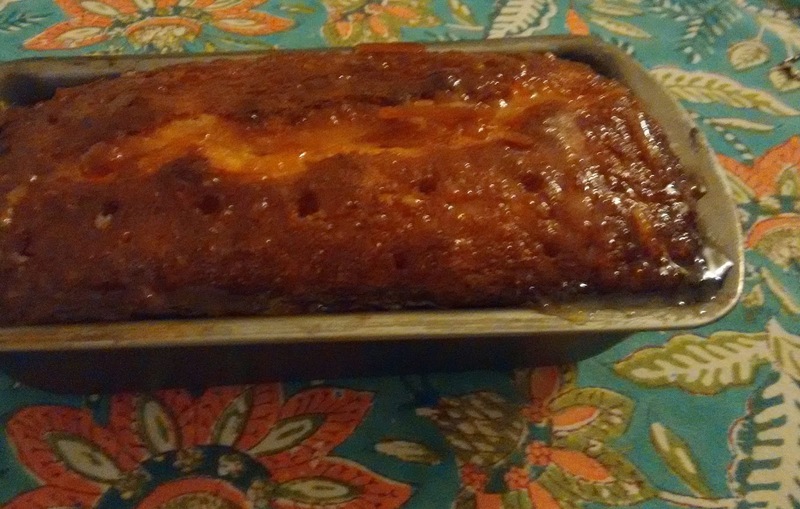 The baking with the loaf out of the tin gives it a crispy exterior. Pour 150 ml into a small bowl and stir in the molasses, and then add the yeast, stirring a few time. Pour the yeast mixture and the remaining 275 ml water into the flour. Do not stir till all the water is added or it will form lumps. However if you have used whole wheat flour like I have the dough will be sticky and rather wet. Scrape the dough into the prepared tin. Cover over lightly with a kitchen towel. Place the loaf upside down directly on the baking rack and bake for another 15 minutes or till done. The bread is done when you tap the bottom and it sounds hollow. The bread can be eaten fresh. Or toasted. With butter, jam and cheese. It even tasted better a day later. There is an amazing group on facebook that shares Konkani cuisine. This recipe is from the site. 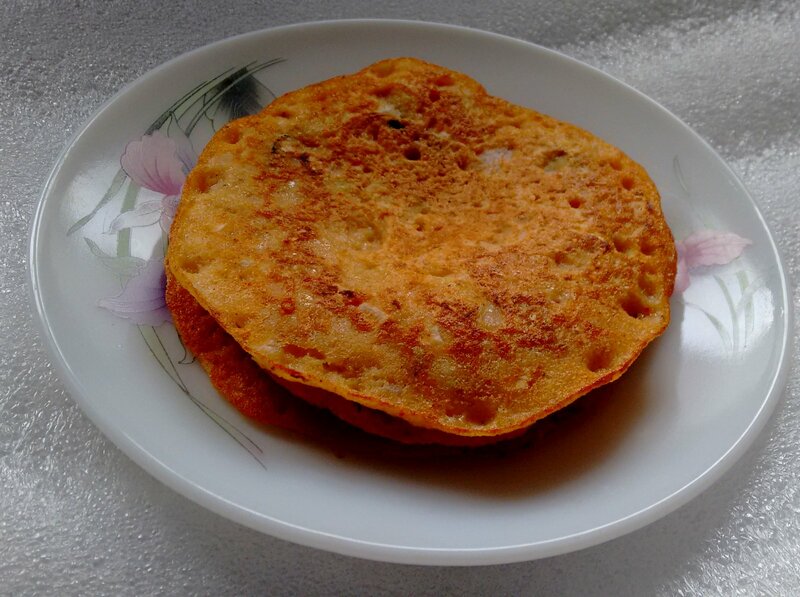 Perhaps the Sanna Polo can be described as a savoury pancake made with rice and lentils with chopped onions and cabbage. 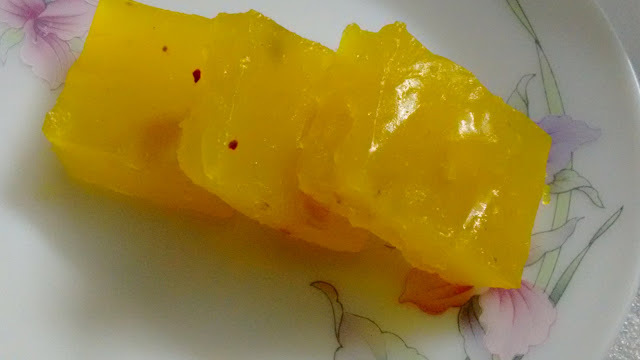 Konkani cuisine without coconut is rare and this one is no exception. Not the usual amount, but it is there nevertheless. Though, it is a polo or a dosa, it is generally consumed as a side dish with rice and dalitoy ( konkani dal dish ). Here chopped cabbage and onions have been added, but these can be substituted with greens, snake gourd seeds and what have you. 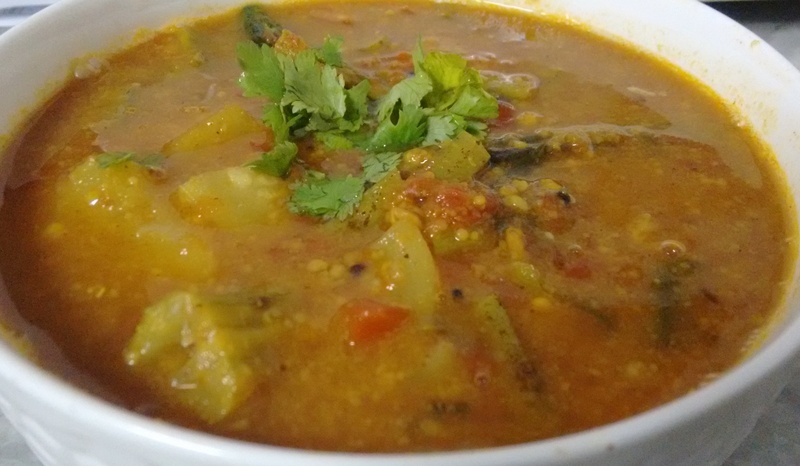 Arhar lentils can be replaced with another. Other spices may be added. Experiment and enjoy the taste. Grind with coconut, chilies, tamarind and salt to a thickish fine paste. This is like an idli batter. Add chopped onions, cabbage and a few shredded curry leaves. Add the batter and spread with either a spoon or use your fingers to flatten it. Serve with hot rice and dalitoy. While that may be a traditional way to eat the sanna polo, let me tell you it can be eaten at any time of the day. Enjoy ! 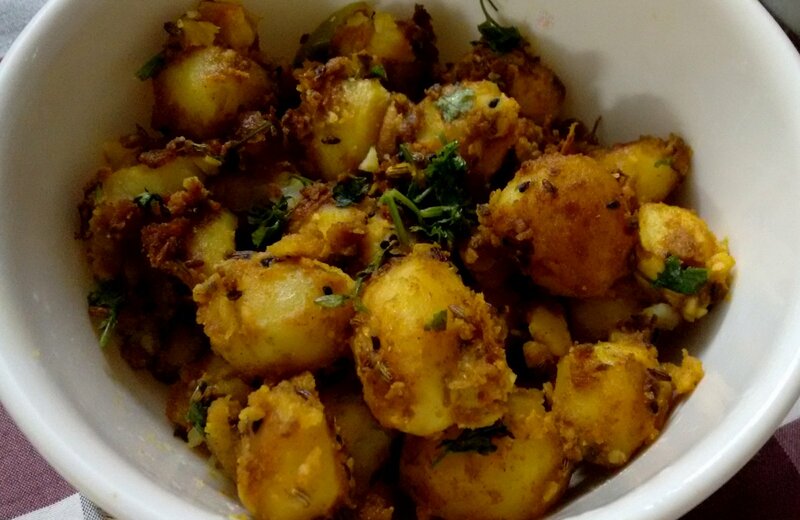 This is a recipe that I watched on a TV show presented by Chef Ajay Chopra, who said this was a typical Bihari dish. It looked interesting enough for me to try. The ingredients like Kalonji, Fennel are not normally used in South Indian cuisine and it has a different taste altogether. And sometimes different tastes are appreciated as this one was. We had it with rotis, but I think it would be great with a bowl of hot rice and dal. Add methi, cumin, kalonji, fennel and asafoetida. Allow to fry with a slit green chili on low heat till turning golden. In a small bowl, take the powders - coriander, cumin, turmeric, salt. Add a little water and make a solution. Mix. Keep covered a little while, stirring carefully now and then. If required a little more oil. I think a squeeze of lime would also add a zing to the dish. 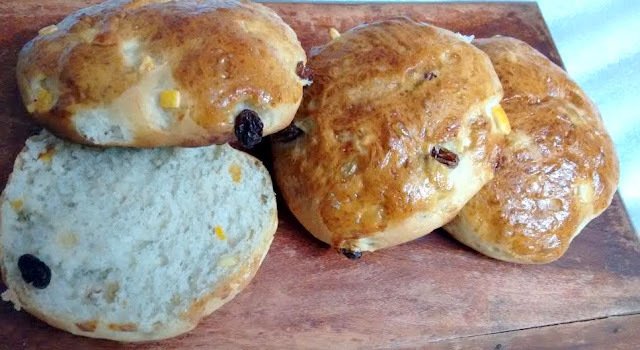 The teacake in England is more like a bun and less of a cake. It is a light yeast based bun with dry fruits. Flat and circular. 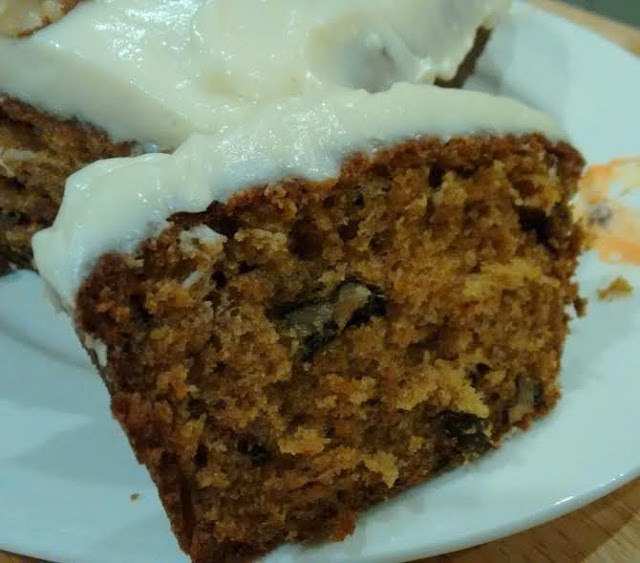 And the recipe of Paul Hollywood has dry fruit, mixed peel and cinnamon powder giving it an amazing flavour. Most times, the teacake is split, toasted and buttered generously. This was better than the store bought teacake. Just out of the oven, it tasted great ! And they say it tastes even better the next day. Take a large mixing bowl, place the flour in it. Add the salt, sugar and cinnamon to one side of the bowl and yeast to the other. Continue to add all water ( if required a little more - I didn't need to ) - the dough should be soft but not soggy. Use the mixture to clean the inside of the bowl and keep gathering the mixture till it forms a rough dough. Coat a work surface with little vegetable oil, tip the dough onto it and knead for 5-10 minutes till the dough forms a soft, smooth skin. Then put it into a lightly oiled bowl, cover with a tea towel and leave to rise until doubled in size for at least an hour or more. Once the dough has doubled, tip the sultanas and mixed peel on top of the risen dough and work them into it. After a minute, put the dough onto a lightly floured surface and knead until the fruit is thoroughly mixed in. Divide the dough into equal pieces. Shape each into a ball and use a rolling pin or fingers to flatten it to a round bun about a cm thick. Space them apart on the prepared trays. Put each tray into a clean plastic bag and leave to rise for about an hour or once again till they double in size. Meanwhile heat the oven to 200C. 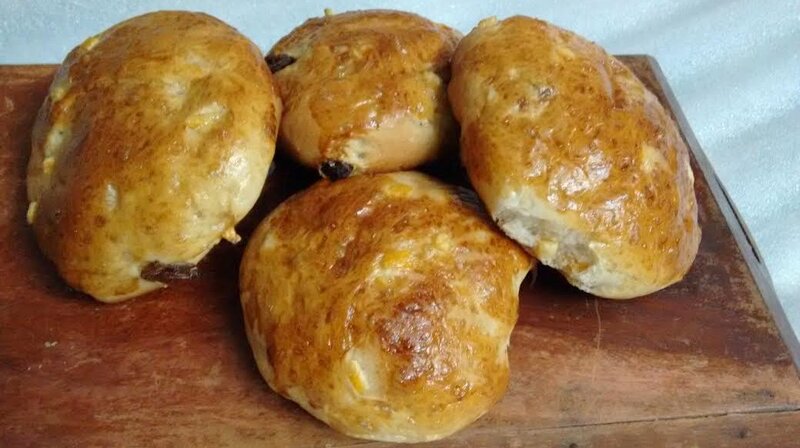 Bake the teacakes for 10-15 cms till risen and golden. Cool on a wire rack. This recipe I have tried a number of times. I feel James Martin recipes are fail-proof. I have made the cake with the icing, and without. With whole meal SRF and all purpose SRF. With and without the nuts. It is totally up to you. If you do put the icing, chill the cake, it tastes even better. This step - try doing it the night before - I never have - put the orange zest and juice in bowl with the sultanas. Or stir in the zest, juice, sultana together and microwave for a minute and keep for a few minutes to soak. Heat the oven to 180 C or 160C fan. Add the sultanas soaked in the juice and zest, grated carrot, nuts and oil-egg mixture into the dry ingredients. Thoroughly mix with wooden spoon. Pour into the prepared tin and bake for 1 hour or till skewer comes clean. Once cool, remove from tin. Icing - with electric whisk, beat soft cheese, butter, icing sugar and cinnamon till smooth. Spread over the top of the cake. Decorate with walnut halves. I actually hate to cook. But, the elder daughter wanted some recipes written for her, I found it simpler to post them online and thus this blog was born. Off and on, I do try some new recipes which feature here as well. I admit that taking pictures and posting the recipe is a motivation to get into the kitchen. Essentially a vegetarian kitchen , you will find a few non vegetarian recipes here too - made for my children. Feb 2012 - an update after 4 years of blogging - Over the years of food blogging, I have developed an interest in food that even surprises me! I still enter the kitchen reluctantly, but I am always excited about trying out something new and sharing it here! Blogging has its advantages! !